JOS, Nigeria (Morning Star News) – Islamic extremists from Boko Haram killed 11 people and kidnapped 20 women as they attacked predominantly Christian Lassa in northeastern Nigeria state last week, the third town a three weeks that the terrorist group claims as part of its caliphate. The Boko Haram insurgents, who seek to impose sharia (Islamic law) throughout Nigeria, invaded Lassa in southern Borno state on Wednesday (Dec. 3), sources said. Survivors who escaped the carnage and arrived at Jos told Morning Star News that the Boko Haram gunmen initially stormed the town on Nov. 29 but were repelled, then returned on Wednesday, destroying church buildings and homes. Church buildings destroyed in Lassa, in the Askira-Uba Local Government Area, include that of the Church of the Brethren in Nigeria (EYN), the largest denomination in Borno state. In Shani, also in Borno state, Boko Haram militants began an attack on Nov. 29 after taking control of Chibok on Nov. 14, forcing hundreds of thousands of people to flee the predominantly Christian towns. The Nigerian military announced that it had retaken Chibok with the help of vigilantes on Nov. 16, but residents insist that Boko Haram gunmen are still in control of the town. Boko Haram has declared all three towns part of an Islamic caliphate, with captured Christians either killed or forced to embrace Islam, survivors told Morning Star News. In the predominantly Christian town of Shani, Boko Haram killed scores of people as thousands of others fled, survivors from the area said. The Boko Haram gunmen arrived on motorcycles and were armed with AK-47 rifles, he said. “They also brought Improvised Explosive Devices and petrol bombs, which they used in attacking our town,” he said. Another resident of Shani who escaped said he saw more than 30 armed Boko Haram gunmen invade. Boko Haram has attacked Shani twice before in the past year. Regarding Chibok, Enoch Mark, an area pastor who has fled, told Morning Star News on Saturday (Dec. 6) that Boko Haram gunmen have retaken the town where more than 300 high school girls were kidnapped earlier this year. Displaced residents of Chibok said that relatives who had been trapped in the town but escaped a few days ago told them that Boko Haram gunmen were still in control. Mark’s daughter and a niece were among the high school girls kidnapped by Boko Haram in April. At least 57 have escaped, leaving 219 of the girls missing, with the group’s leader saying they have been converted to Islam and married off or sold. Samuel Dali, president of the EYN in Nigeria, who also has been displaced by the Boko Haram attacks, confirmed the attacks on the three Christian towns, saying many of his church members have been displaced. While Boko Haram (translated as “Western education is a sin”) is the moniker residents of Maiduguri, Borno state gave the insurgents, the group calls itself the Jama’atu Ahlis Sunna Lidda’awati wal-Jihad, translated as “The Congregation of the People of Tradition for Proselytism and Jihad.” It has ties to Al Qaeda, and the United States designated it as a Foreign Terrorist Organization in November 2013. 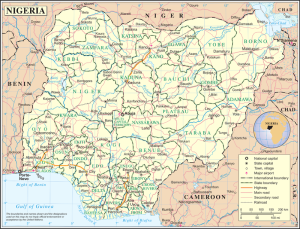 Christians make up 51.3 percent of Nigeria’s population of 158.2 million, while Muslims account for 45 percent and live mainly in the north.